As of Acropolis Base Software (NOS) version 4.6, Nutanix released a set of Acropolis drivers that provide Openstack + Nutanix integration. These drivers allow an Openstack deployment to consume the Acropolis management infrastructure in a similar way to a cloud service or within a datacenter. I intend to use this series of blog postings to cover a walk-through of setting up the Nutanix Openstack drivers deployment and configuring cloud instances. The integration stack works by having the Openstack controller installed in a separate Nutanix Openstack Services VM (Nutanix OVM). The Acropolis drivers can be installed into that same OVM. These drivers then interpose on the Openstack services for compute, image, network and volume. By subsequently translating Openstack requests, into the appropriate REST API calls in Acropolis management layer, a series of Nutanix clusters are then managed by the Openstack controller. All-In-One Mode: You use the OpenStack controller included in the Nutanix OVM to manage the Nutanix clusters. The Nutanix OVM runs all the OpenStack services and the Acropolis OpenStack drivers. Driver-Only Mode: You use a remote (or upstream) OpenStack controller to manage the Nutanix clusters, and the Nutanix OVM includes only the Acropolis OpenStack drivers. In either case, Nutanix currently only supports the Kilo release of Openstack. 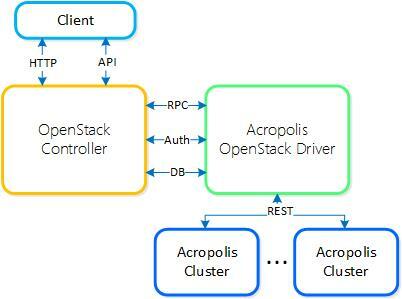 I will go into further detail around Openstack and Acropolis architecture integration in future posts. For now let’s start by getting things set up. First requirement is to download the OVM image – from the Nutanix Portal – and then add it to the Acropolis Image Service…. Note: if you are unfamiliar with creating a network for your VMs to reside on then take a look here , where I discuss setting up VMs and associated disks and networking on the Nutanix platform. For now let’s consider the all-in-one install mode , there are just three steps…. one cluster at a time. Just to point out one or two things in the above CLI. The IP address for both OVM and Openstack controller are the same – should make sense as they are both part of the same VM in this case. Also, use the Cluster Virtual IP when registering the cluster. This is for HA reasons. Rather than use the IP of an individual CVM, use the failover IP for the cluster itself. You need to specify a container name if it is not default (or there are more than one). You can now verify the base install using…. Summary : Acropolis drivers for Openstack Kilo. I hope this is enough to get people started looking at and trying out Openstack deployments using Nutanix. In the next series of posts I will look at configuring images, setting up networks/subnets and then move on to creating instances. This entry was posted in Acropolis, Cloud, DevOps, Openstack, XCP and tagged Acropolis Drivers, all-in-one, Cloud, drivers-only, hybrid cloud, Image Service, kilo, Openstack, Openstack Controller, Openstack Services, OVM, ovmctl on 21st March 2016 by Ray Hassan.